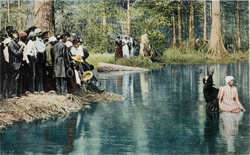 On the 19th-century history and 21st-century relevancy of the famed photographer. In her book Motion Studies: Time, Space and Eadweard Muybridge, Rebecca Solnit writes that one of the most common phrases of the late 19th century was “the annihilation of time and space.” The steamship, the telegraph, the railroad — what Emerson called “one web” of a “thousand various threads” — and the photograph each played a role in destroying older notions of time and place. But as Solnit suggests, at heart of this annihilation was a conviction that viewed “the terms of our bodily existence as burdensome,” and that believed technology could do for us what our bodies couldn’t. 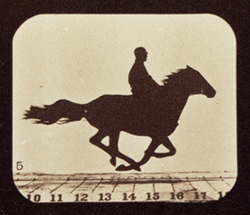 “Helios: Eadweard Muybridge in a Time of Change” February 26 through June 7. San Francisco Museum of Modern Art, San Francisco. The medieval aesthetic in the 19th century. “In my heart I thought that only beautiful things should be painted, and that only ancient things and the stuff of dreams were beautiful.” Yeats said that once in reference to the Pre-Raphaelites. It’s an absurd statement on the face of it. You can’t just hold out for beauty and dreams. We all know that. We all have to grow up, just as civilization has grown up, moving from the pre-modern days of myth and fable to the enlightened present, a disenchanted era in which we see the universe as it really is. Right? 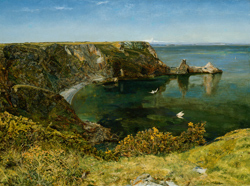 “The Pre-Raphaelite Lens: British Photography and Painting, 1848-1875.” Through January 30. National Gallery of Art, Washington, D.C.